Eye black for a team, eye black for a school, or eye black for a tailgate. Our Classic Eye Black has been used for team giveaways, school field days, camp color wars, and as a new and fun giveaway. Promote your school, team and school unity. Great booster club or activity fundraiser. Min 250 85 cents per 2 pair pack, 500 82 cents per 2 pr pack, 1000 pr 79 cents per 2 pr pack, 2500 72 per 2 pr pack. No set up. 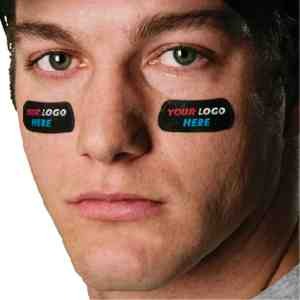 Get your customized eye black to promote your brand, school or team identity and unity. Full color imprint, digitally imprinted. Can do black background or other colors as well. Imprint area is .75″ x 1.5″. Great for corporate branding and more. Comes packaged in sets of 2 pairs with dividing line. Made in USA. Item AEB. 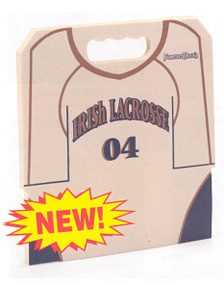 Eyeblack pairs work great for creating branding of a logo, a school mascot, corrporate and more. Item AEB. 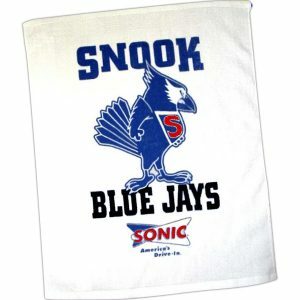 Looking for a rally sports towel? Minimum is only 100 pieces on this towel. 18″ x 15″ white cotton towel. 1 sided velour (hemmed). Soak up the spirit with a 14 x 10″ imprint area, one of the biggest imprint areas in the industry for these type of towels. Put your school name or logo on these and the entire school or community becomes your customer. Great for smaller sports or activities. 100 at 2.20, 250 at 2.05, 500 at 1.90, 1000 at 1.65. Set up is 40.00 per imprint color. Additional imprint colors 25 cents ea at 250 or more. Item number towel18. Calendars are a stand-by in the world of school fundraising activities. 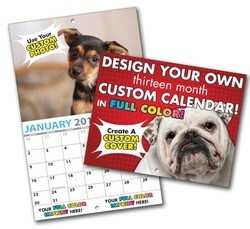 Our pricing can’t be beat on these custom full color imprinted wall calendars – Use your own photos (300 dpi min), start with any month you choose. Great for school, booster club or team fundraiser! A different coupon can be printed for each month. Offset the price of the calendars by getting sponsors to put coupons. Good way to reach out to community and reach other businesses. 100 5.31 ea, 250 4.10 ea., 500 3.22 ea, 1000 1.96 ea, 2500 1.52 ea. Ask for pricing on higher quantities. Need a great fundraiser for your school or sport? Camo t-shirts with school logo or phrase can be a great fundraiser. Great for community walks and awareness events. Order pink early as pink is very popular. Available in pink, green or gray. Great for stitching your info or imprinting in black or navy. (white or light imprint not recommended). Ladies sizes S-2X, mens , baby and youth sizes as well. The State Champions – your source for all your commemorative apparel and more. Order promotional and specialty products to help support your school today!